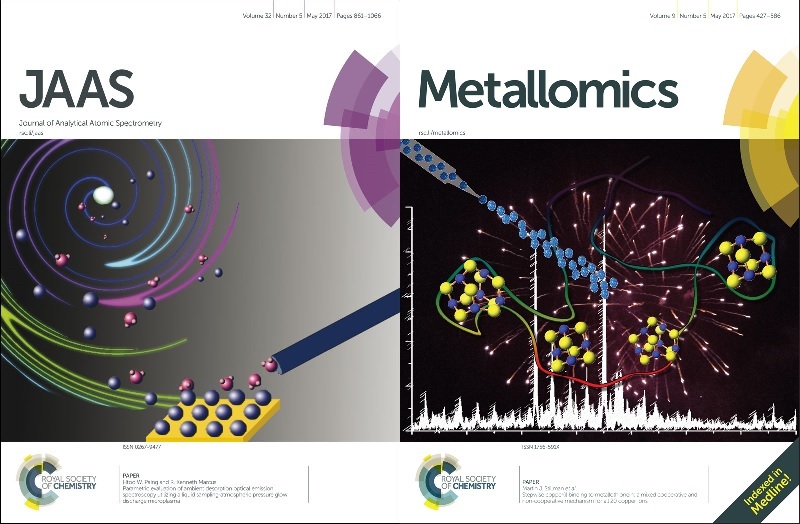 We are honoured to announce the publication of an online web collection with JAAS and Metallomics dedicated to the memory of Joe Caruso. Joe was a well-known and highly respected leader in the field of analytical chemistry and plasma spectrochemistry in particular – more recently he made great contributions to the fields of elemental speciation and metallomics. Over the years he had been very active for the Royal Society of Chemistry and as well as serving as Chair for JAAS, he was the founding Chair for Metallomics, and became one of the leaders in this emerging area of exciting research. This very special compilation highlights analytical research being conducted in these areas. We believe that this collection of papers is a fitting memorial to an inspiring mentor and outstanding chemist. We thank the guest editors Gary Hieftje and Maria Montes-Bayon, and those who were able to contribute to the collection for their support of this very special memorial. 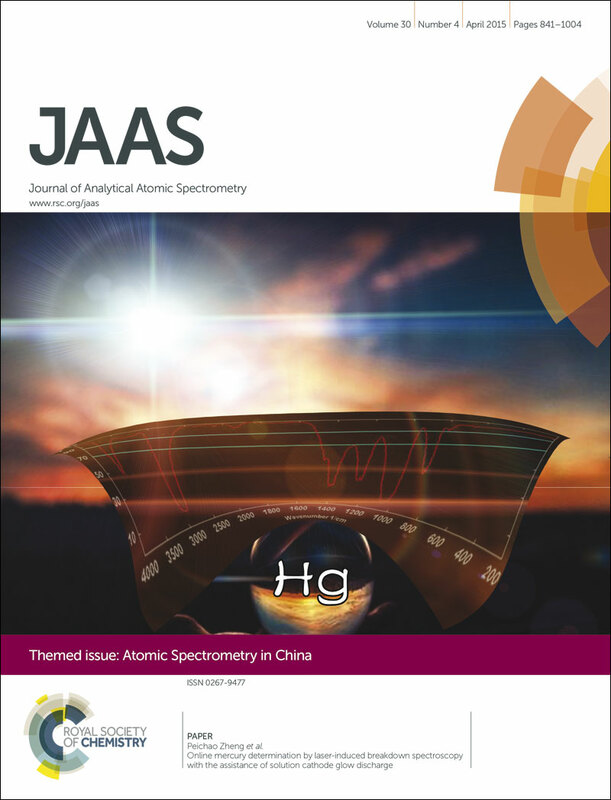 The new themed issue for JAAS dedicated to showcasing the latest high impact research in speciation analysis is now published. Guest edited by Professor Gunda Koellensperger and Dr Heidi Goenaga-Infante, this issue is dedicated to the newly emerging work in this exciting area of research. Read their introductory editorial here . You can check out the complete issue here. As with previous EWLA conferences in the past, JAAS is proud to be publishing a themed issue on laser ablation to feature papers from the conference and to highlight the latest advances in laser-based microanalytical techniques. The deadline for submission is 30 September 2016. This upcoming Themed Issue in JAAS will aim to showcase the latest discoveries and developments in speciation analysis. For your article to be considered for the themed issue, we must receive your manuscript by the new deadline of 1st April 2016. Guest Edited by Professor Gunda Koellensperger (University of Vienna, Austria) and Dr Heidi Goenaga-Infante (LGCGroup, London, UK), this upcoming themed issue will highlight the most outstanding work in the area of speciation analysis, and also provide some insight into the newly emerging work in this exciting area of research. Communications, full papers and review articles are welcomed, if you are interested in submitting to this themed issue please contact us to let us know. Guidance on preparing your papers can be found here: http://www.rsc.org/journals-books-databases/journal-authors-reviewers/. 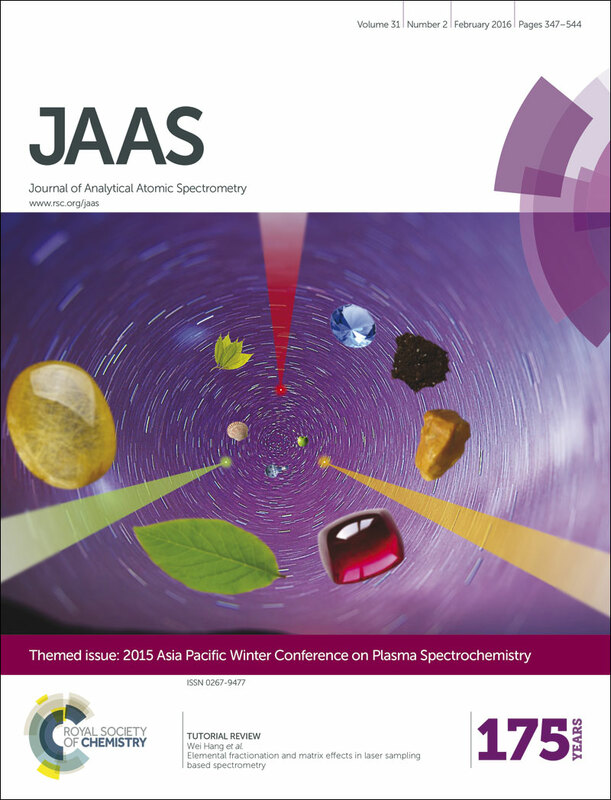 Asia-Pacific Winter Conference collection now published! We are pleased to announce that the collection of papers from last year’s meeting is now available to read online. This is a collection of papers showcasing some of the topical research presented at the 2015 Asia-Pacific Winter Conference on Plasma Spectrochemistry, held in Xiamen, China, May 19-22, 2015. Make sure to read the Introductory Editorial from Guest Editor and Conference Chairman Wei Hang. You can access the online version of the collection here . 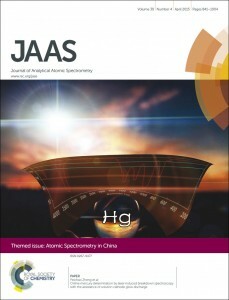 You are invited to contribute to the upcoming JAAS themed issue showcasing the latest discoveries and developments in speciation analysis. Guest Edited by Professor Gunda Koellensperger (University of Vienna, Austria) and Dr Heidi Goenaga-Infante (LGCGroup, London, UK) this upcoming themed issue will highlight the most outstanding work in the area of speciation analysis, and also provide some insight into the newly emerging work in this exciting area of research. For your article to be considered for the speciation analysis themed issue we must receive your manuscript by March 1st 2016. Will you be joining us in Xiamen later this month? If so, on behalf of the organisers and JAAS Editorial Board, we would like to invite you to submit an article for a themed issue in JAAS, on your work presented at the conference. The submission deadline for the issue will be 15th July 2015. Accepted papers will be published online as advanced articles as soon as they are ready. The issue will be published online and in print in early 2016. All authors will receive a PDF of their article and a print copy of this issue when it is published. There will be no upper limit on the number of papers published in the themed issue. We welcome the submission of communications, full papers and technical notes for consideration in the issue, and all articles will be subject to the usual high standards of the journal through peer-review. If you are interested in writing a review article for the issue, then please do not hesitate to contact me by email. We will also have a JAAS 30th Anniversary Event on the Friday night, so please do come and speak to me! Articles should be submitted through the JAAS website, and we kindly ask all authors to indicate in their covering letter that their article is for consideration in the APWC 2015 issue. Further details about what we have to look forward to can be found on the conference website. 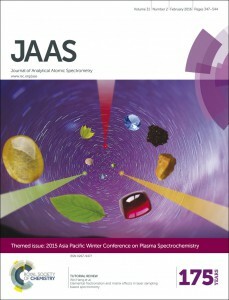 We are delighted to announce that once again, JAAS will be publishing a themed issue from the 2015 Winter Conference on Plasma Spectrochemistry. The submission deadline for the issue will be 10th April 2015, with the option of having your article published online as soon as it is accepted. The issue will be published online and in print in summer 2015. If you need any extra time to complete your manuscript, do let us know and we would be happy to discuss this with you. We welcome the submission of communications, full papers and technical notes, and all articles will be subject to peer-review. 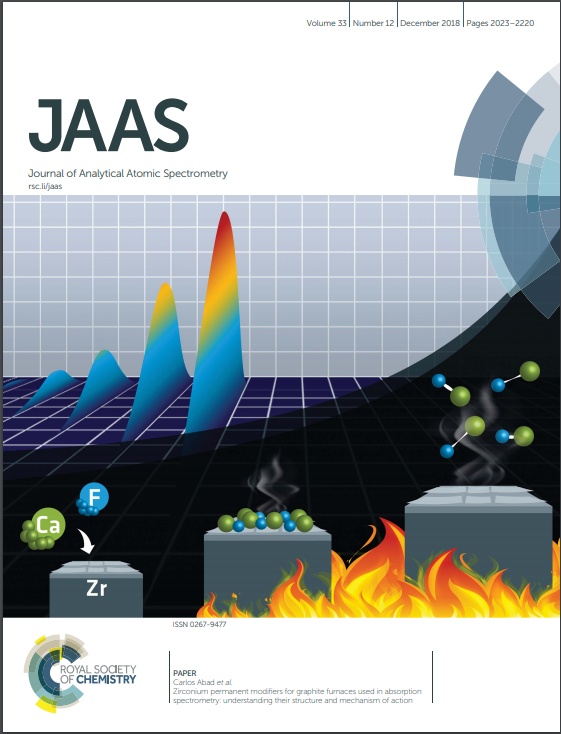 If you are interested in writing a review article for the issue, please do not hesitate to contact me (jaas-rsc@rsc.org) or JAAS Editorial Board Chair, Frank Vanhaecke, to discuss a possible topic. You can submit your article by uploading your manuscript through the journal website. Don’t forget to mention in your cover letter that you article is intended for the Winter Conference themed issue. We look forward to reading your next article!